DiskSavvy is a powerful, fast and easy-to-use disk space analyzer allowing one to analyze disks, network shares and NAS storage devices. The user is provided with the ability to analyze one or more directories, disks or network shares, detect directories and files holding significant amounts of the disk space, display pie charts, export disk space usage reports and perform multiple file management operations such as file copy, move and delete. ...... named DiskSavvy Pro, which is capable of processing significantly larger amounts of files, allows one to analyze specific file types, provides additional report formats and enables execution of user-defined disk space analysis commands using direct desktop shortcuts. 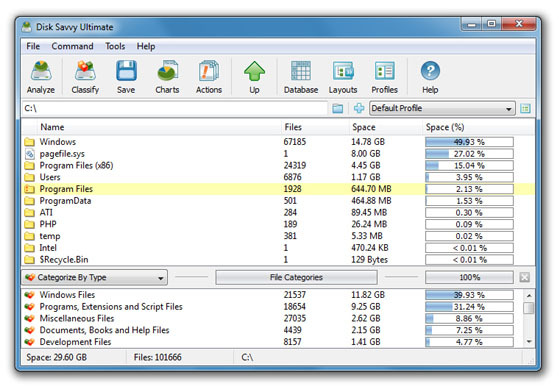 Finally, DiskSavvy Ultimate, which is especially designed for IT and storage administrators, allows one to submit disk space analysis reports from multiple servers or desktop computers to a centralized SQL database, analyze disk space usage per host, analyze the amount of used disk space per user, define custom rule-based disk space analysis actions and perform automatic disk usage analysis operations using the DiskSavvy command line utility. Qweas is providing links to DiskSavvy 4.5.26 as a courtesy, and makes no representations regarding DiskSavvy or any other applications or any information related thereto. Any questions, complaints or claims regarding this application DiskSavvy 4.5.26 must be directed to the appropriate software vendor. You may click the publisher link of DiskSavvy on the top of this page to get more details about the vendor.